Image, Inquiry, and Transformative Practice: Engaging Learners in Creative and Critical Inquiry through Visual Representation. Ed.by Lynn Sanders-Bustle. New York: Peter Lang. 2003. 183 pp. 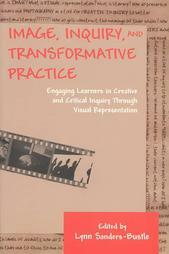 overview: Image, Inquiry, and Transformative Practice is directed at teachers across the curriculum, but the book offers ways of reconceptualizing and reflecting on our teaching that are specifically appropriate for writing instructors: it explores ways that teachers use images in the classroom to help students both to develop their understanding and to (re)present their understanding of classroom subjects. The book is presented as a series of narrative inquiries. All of the chapters provide detailed contextual information as well as data from multiple sources, and ultimate interpretation is left up to the reader. The book is made up of five chapters, two written by Sanders-Bustle herself. In the introduction and her two chapters, Sanders-Bustle seems overly concerned with legitimizing the use of visual information in classrooms, perhaps reflecting the academy’s tendency to devalue images in favor of linguistic ways of making meaning. She calls for a redefinition of literacy that includes interpretation of visual images and suggests that the teaching of writing must be inclusive of image interpretation and use. Her arguments are convincing but not original (see, for example, Bernhardt, 1986; Murphy, 1972; O’Rourke, 1981; Stroupe, 2000). Sanders-Bustle argues that educators have the duty to prepare students for a world where the dissemination of information is changing from a world of books and newspapers created on a printing press to digital information disseminated electronically and viewed on a computer screen. She suggests that teachers have the responsibility to “reconsider the forms of representation that dominate sense making” (p.1), and I posit that this responsibility is particularly critical for us as teachers of writing. Sanders-Bustle describes using images in a classroom of pre-service teachers to reaffirm and extend prior knowledge and to function as ambiguous prompts for self-reflection. She uses images in the classroom to emphasize to students the idea of interpretation itself, which has important implications for literature teachers struggling to help students understand what it means to “interpret” literature through many lenses. She applies “viewer response theory,” citing Dake, 1995, to images parallel to how Rosenblatt’s Reader Response Theory is applied to texts. the interpretive nature of image offers a pluralistic venue for the exploration of questions. Visual representations invite questions and multiple perspectives, encourage exploration and engagement, and allow learners to ‘break free’ from that which has been done before them. (p. 13). She argues, therefore, for the use of images in creative inquiry as a way of promoting holistic, unique interpretations and increasing student investment. The examples of images used in the classroom show students being asked to relate concepts to their own lives. Students used photos “to make authentic connections between themselves, the highly complex concept of literacy, and their physical and social environments.” (p.45) Besides making those connections more obvious, the use of images may help to make those connections more concrete. Chapter 2, by Kimerberly L. Oliver, is an explanation of one educator’s ongoing inquiry into the use of images with female adolescents. Working weekly with two small groups of students, she helped them explore teen magazines and other cultural images to see how girls can construct a meaning of their bodies and how they can resist forms of enculturation. In particular, I appreciate this chapter’s recognition of the young women’s agency rather than the woman-as-victim-of-media depiction (see Gerrard, 2002, for a good characterization of this phenomenon). Oliver explains that she began using teen magazines in an attempt to help girls name oppressive and empowering images of the body and to encourage their critique of these visual images and of their impact on girls’ health. Though this chapter focuses primarily on the unique experiences of teaching adolescents, it provides a clear example of the resulting motivational power of images from popular culture integrated in the classroom. In Chapter 3, Rosary Lalik describes her use of images of homelessness to evoke interest among students and to help them construct expanded concepts of society and social pressures. This chapter is presented as a story of how she used photos in her classroom, mainly as tools for pre-reading and consciousness-raising. Unfortunately, the idea of the image itself and the use of images are less explored in this chapter. I wondered about the choice of image rather than poetry or other text-based information, and I wish that Lalik had explored ways that students might have been differently affected by different media. Chapter 4 explores Liz Altieri’s use of images to affect students’ understanding of disability. She points out that most Western representations focus on people’s handicaps rather than on their abilities and asks students to evaluate images of disability and ways that those images have shaped policies and social assumptions. In contrast to most of the other projects described in this book, the final project of this course required students to break from, rather than to merely supplement, their reliance on linguistic representations of knowledge. The final project did not allow students to use expository writing. Altieri justifies this requirement by explaining that “the very act of experimenting with new forms is disruptive and leads us to question what we consider to be reality,” (p.127) making visual (re)presentations of knowledge particularly appropriate for transformative learning. Bernhardt, S.A. (1986). Seeing the Text. College Composition and Communication, 37(1), 66-78. Gerrard, L. (2002). Beyond 'scribbling women': women writing (on) the web. Computers & Composition, 19(3), 297-314. Murphy, S. (1972). TV footage in the composition classroom. College Composition and Communication, 23(1), 50-53. O'Rourke, B. (1981). Whatever happened to visual literacy? English Journal, 70(2), 71-73. Stroupe, C. (2000). Visualizing English: Recognizing the hybrid literacy of visual and verbal authorship on the web. College English, 62(5), 607-632.